The Digital Promotion Center is the ideal way to market your image. 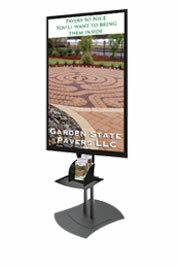 Fabricated in brushed aluminum and black laminate.Perfect for hotels, Banks, Retail, Restaurants, Hospitals, & Lobbies. Powered by the Gallery 2000.